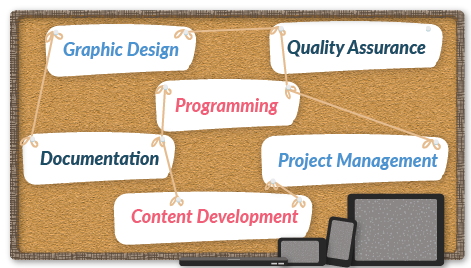 We provide turnkey software solutions, editorial development of learning objects, and quality assurance services for digital and print based products. Need to create educational content for the field of mathematics? Whether you need a single interactive game or tool, a SCO (Shareable Content Object), or a full course, we have the expertise. We provide a range of editorial services including writing content, copy-editing, identifying and recording metadata and providing Alt descriptions for accessibility. We create specs for digital assets and can bring your ideas from brainstorming to fully functional, engaging, digital content. We write code in the programming or markup language that will best suit your needs. We will make your product work seamlessly on the platform or platforms of your choice. No one wants a buggy piece of software or incorrect math solutions. We test software vigorously and on several different form factors to make sure it works the way it's supposed to. We do quality assurance for print and digital products. We have the expertise for cold solving and error checking your math solutions from Elementary to Higher Ed. Want your software to look and feel amazing? Our in-house designers work hard to keep on the cutting edge of current trends in the world of visual design. Have an idea for an app, interactive, or website? We can spec it out for you! We write plain-language specs for your digital project to help you better visualize the end result. We think through all the details so you don’t have to! See a small sample of our projects, both turnkey solutions and segments of larger projects. MathResources is proud to offer quality, reliable math software.